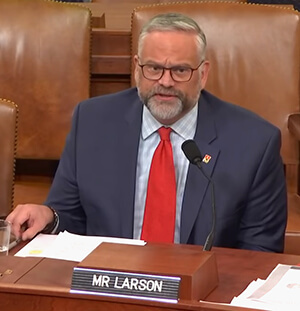 At a hearing before the Trade subcommittee of the U.S. House Ways & Means Committee, CWA's Director of Legislation, Politics, and International Affairs Shane Larson testified on how the Trump Administration's NAFTA 2.0 falls short for working families. At a hearing on Tuesday before the Trade subcommittee of the U.S. House Ways & Means Committee, CWA's Director of Legislation, Politics, and International Affairs Shane Larson testified on how the Trump Administration's NAFTA 2.0 falls short for working families. "The simple fact is that the current draft of NAFTA 2.0 doesn't fix NAFTA's problems, and makes some even worse," Larson said. "Congress must send negotiators back to the table to resolve some of the most egregious problems with this agreement." Larson said that from the beginning of the renegotiation process, CWA asked for language to be included to keep good call center jobs in the United States, but the language has not been added to the agreement. "The offshoring of call center jobs raises risks for consumer data and puts downward pressure on standards in the U.S.," he said. Larson also stressed the importance of having a way to enforce labor laws in the agreement. "We need an enforcement mechanism that works, moves in a timely way, contains real penalties for violators, and is not left to the sole discretion of parties who have demonstrated at length that labor rights enforcement is not a priority for them."